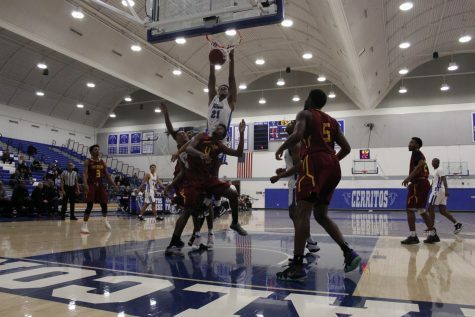 The Cerritos College men’s basketball team capped off its third win in a row after facing off against Compton College Jan 30. This win puts them at 3-0 in the conference and back in the driver’s seat in first place. 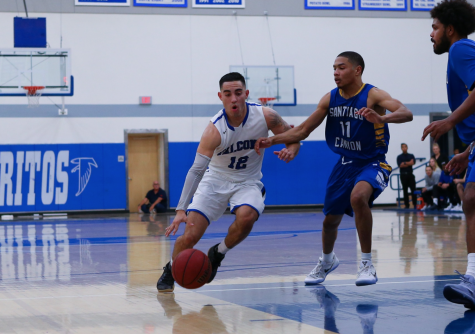 This was another large margin victory for the Falcons beating Compton 90-73, following Friday’s 46-point rout against conference foe El Camino. When playing against undersized teams such as the Tartars, the Falcon’s objective for games is to exploit the match-ups and pound the ball into the paint. 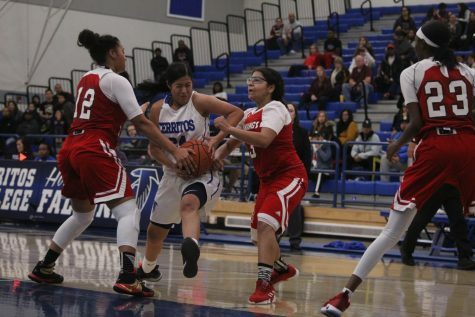 Though the scoring onslaught didn’t ignite until midway into the first half, Cerritos managed to penetrate the Compton offense by rotating from zone and man-to-man defenses throughout the game. On the other hand, Compton’s offense shot 41 percent from behind the arch, not to mention a Steph Curry-esque three at the buzzer to end the first half. The times they did make it into the paint the Cerritos bigs were there with the help defense. Early in the second half, sophomore guard Christian Alvis-Labadie suffered a fall on his ankle fighting for a rebound. The fall shocked the crowd and he was carried off of the court by teammates. Freshman guard No. 13 Chance Hunter led the charge in rebounds, contributing 14 of the squads 47 total boards. As the proclaimed “head of the horse” by fellow guard, No. 1 Cody Wilkes, scoring opportunities begin and end with Hunter. Just as Wilkes feeds off of Hunter, No. 5 point guard Tawon Elston feeds off of Wilkes. The prolific scorer says he takes a while to get going on the offensive side of the ball. He is a second half player, and it showed with most of his 14 buckets coming later in the game. This gave the Falcons some insurance. Wilkes led the Birds in scoring with 18 points shooting 7-12 from the field, and 4-8 from three. Feeling as though inconsistency had struck early in the season, the sophomore guard feels that finding consistency now, referring to this three-game win streak, will be good as the playoffs approach. When asked about how high the team could fly this year he smiled and said, “I think we can go all the way. We’re hitting our run now, which is good, instead of in the beginning and middle. We started off strong then kind of fell off, but everything is coming back along now. 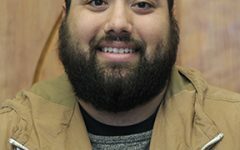 As long as we stay on the same page we’ll be good,” he said. The coach believes that the team is playing its best basketball thus far and that there is room for his men to grow. With playoffs only three weeks away, they hope to continue that stretch dominance. 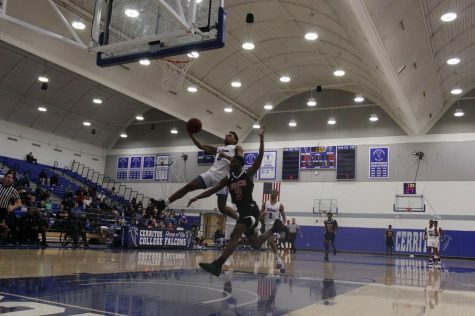 Cerritos men’s basketball will square off at second place Los Angeles Southwest Friday Feb. 1 at 5 p.m., in an attempt to maintain their status as top dog in the SCC.